Mid-morning in downtown Tunis, hundreds queued in line proudly to vote, many for the first time in their lives. People walk to join the end of the line to vote in Tunis. 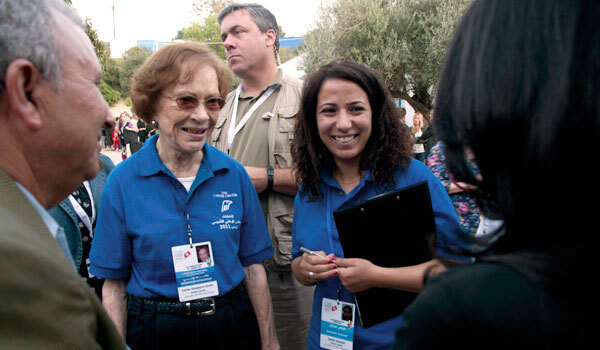 Former First Lady Rosalynn Carter talks with people waiting to vote in Sidi Bou Said, Tunisia, along with her translator Nedia Haddad. 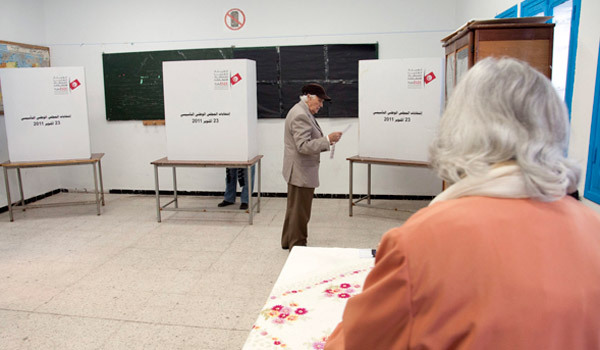 A man studies the ballot before heading behind the booth to make his selection. 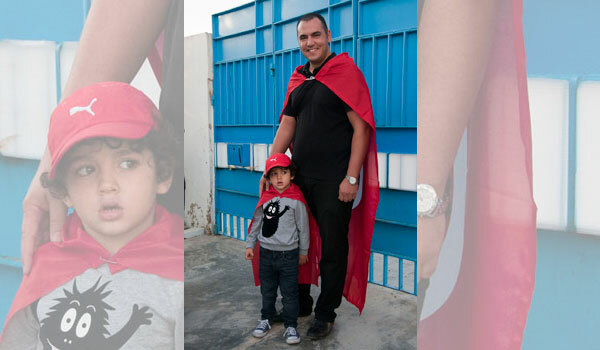 This man brought his young son to watch him vote, both enthusiastically draped in a Tunisia flag cape. Carter Center delegation leaders Mrs. Carter; Dr. John Hardman, Carter Center president and CEO; and former Mauritius President and Club of Madrid member Cassam Uteem address the media at a Tunis polling center. 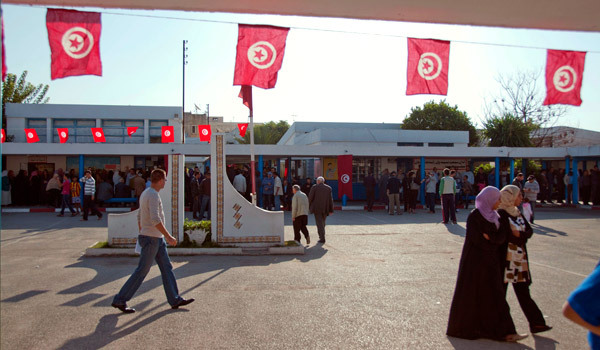 The Tunisian flag could be seen in many places, strung across polling centers; hung from light posts; and draped on people, buildings, and cars. 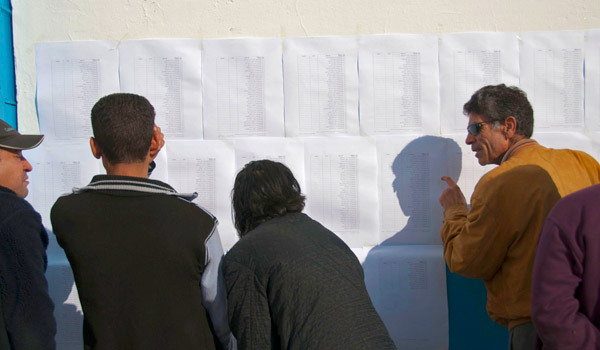 People look for their names on the voter list in downtown Tunis. 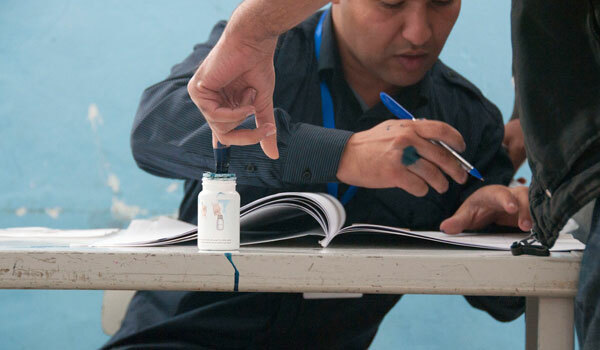 A poll worker stamps the back of an unmarked ballot before handing it to a voter. A voter dips his finger in indelible ink. The ink got a little messy at times, as this was a new thing for many people and they weren't sure how much to dip. A military officer greets observers, including delegation co-leader President Cassam Uteem. 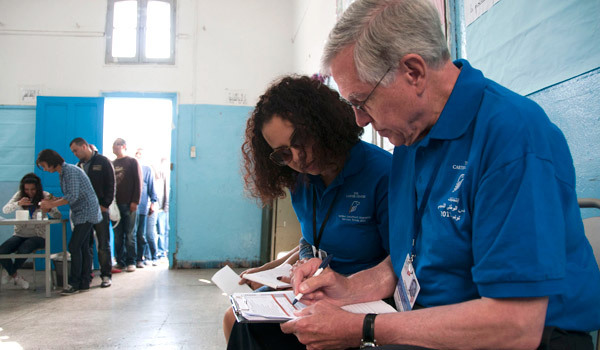 Delegation co-leader Dr. Hardman completes his observer checklist with translator Nedia Samet, as a voter inks her finger in the background. 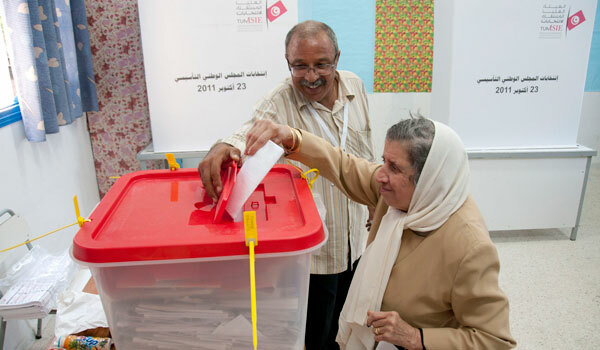 A poll worker assists an elderly woman to cast her ballot. 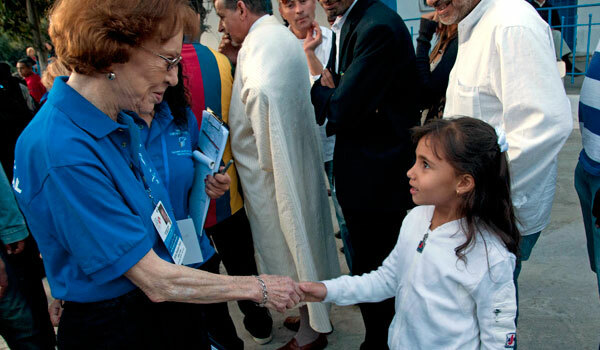 Mrs. Carter greets a little girl who has come to watch her parents vote in Sidi Bou Said. 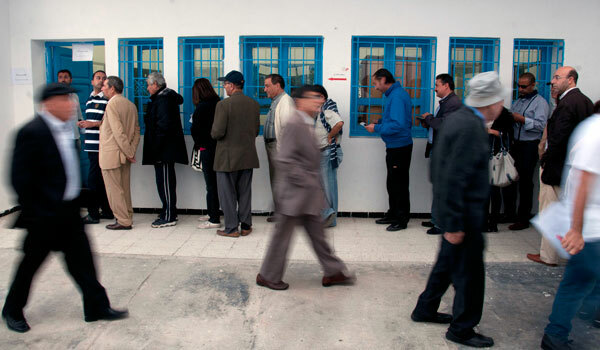 Long lines of Tunisians waited for hours to vote on Sunday to choose 217 members of a Constituent Assembly to draft a new constitution--many casting a ballot for the first time in their lives--in the country's first open and competitive election in decades. 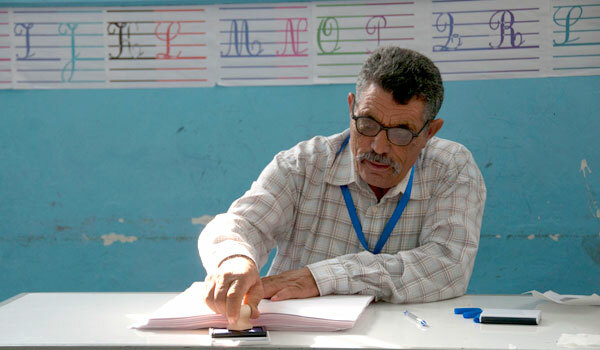 "Before, it was useless to vote, it meant nothing here," said Lotfi, 55, of Tunis. "Now it is our future and that of our children. This is making us very proud." Many others spoke of their hope for a brighter future for the economy, development, and democracy. "Voting is our right," said Mohammed, 19, a university student. "We want to live free and have good opportunity. I want a job and to be able to raise a family." 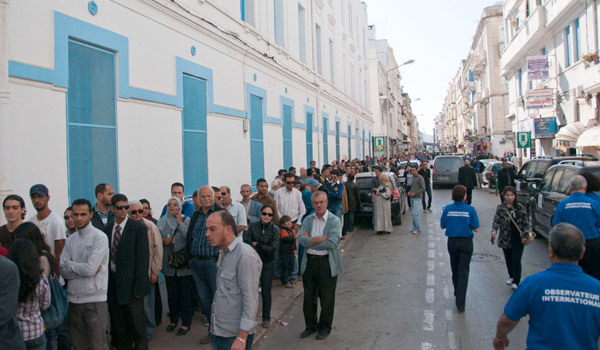 At 3:30 p.m., many poll centers in Tunis still had hundreds of people in line. People draped flags around themselves and took pictures with friends, some pulled up chairs to rest, and others simply quietly waited, as the afternoon sun's shadows grew long. Across the city of Tunis, Tunisian flags were hung from light posts, strung across polling stations, even draped across cars. The sense of pride was palpable. 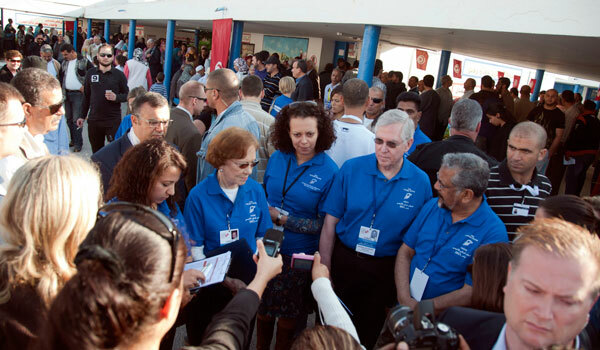 "Tunisia launched the Arab Spring and now was the first to hold elections," said Dr. John Hardman, president and CEO of The Carter Center, who is co-leading the Center's 60-member election observation mission to Tunisia with former Mauritius President Cassam Uteem and former First Lady Rosalynn Carter. "What happens here could be a model for other countries in the region like Egypt and Libya. It's significant. Everyone will be watching this process." The Carter Center's long-term observers have been deployed since early August and were joined by a larger short-term delegation to monitor the counting and tabulation processes. 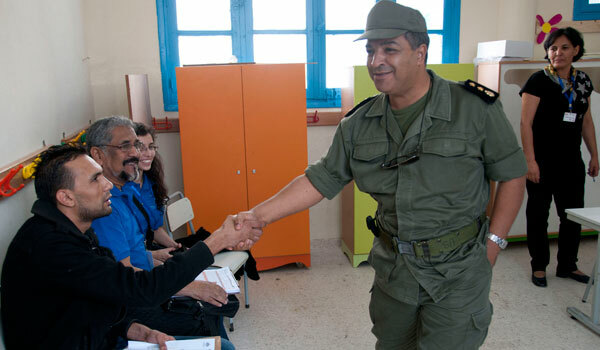 On Oct. 24, observers returned to Tunis to debrief with the group after their deployment throughout the country. Their findings will form the basis of the Center's preliminary findings, to be released on Oct. 25 and available at www.cartercenter.org. The Center will remain in Tunisia through the resolution of electoral complaints for the National Constituent Assembly elections.